Winter 2014 Program Guide Schedule for Yoga & Qi-gong! Sundays, 10:45am-12:15pm (Monthly Workshops: Jan 26, Feb 23, Mar 30)! DRAGON SPIRIT YOGA™ This program brings together the Taoist Internal Arts of Chi-kung with Hatha/Vinyasa Yogic practices. 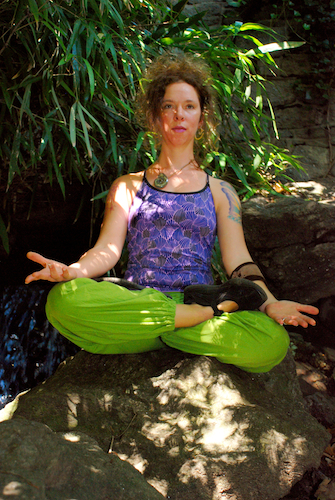 Modified poses & posture flows will be offered to meet all levels of experience. This fusion style, is rooted in traditional disciplines that explore a series of still restorative poses, self-massage techniques & breath-work exercises with focus on synchronizing breath in combination with energizing sequences of flowing movement. RADIANT LOTUS WOMEN’S QI-GONG™ This Internal Art program is specifically designed to empower women practitioners in self-health care. Classes consist of movement techniques and breath exercises that have the capacity to help practitioners realize healing potential and to reach optimal levels of health. *DROP IN STUDENTS WELCOME (PLEASE CONTACT INSTRUCTOR IN ADVANCE IF INTERESTED)! Instructor: Gabrielle de Burke is an Experienced & Registered Yoga Teacher with the Yoga Alliance (EYRT), a Certified Tao Yin Yoga/Chi-kung Level II Instructor with Spirit Wind Internal Arts Society & a Level I Instructor of Radiant Lotus Women’s Qi-gong with Daisy Lee. Contact: LungShen@earthtones.com / 484-557-9605 / www.dragonspiritarts.com! or contact Erica Sollberger @ 610-284-1493! *CLICK HERE TO SEE PDF OF FLYER/POSTER: 2014FINALWinterflyer4Classes! ← 2013 Winter Solstice Salutations & Yule-tide Vibrations!